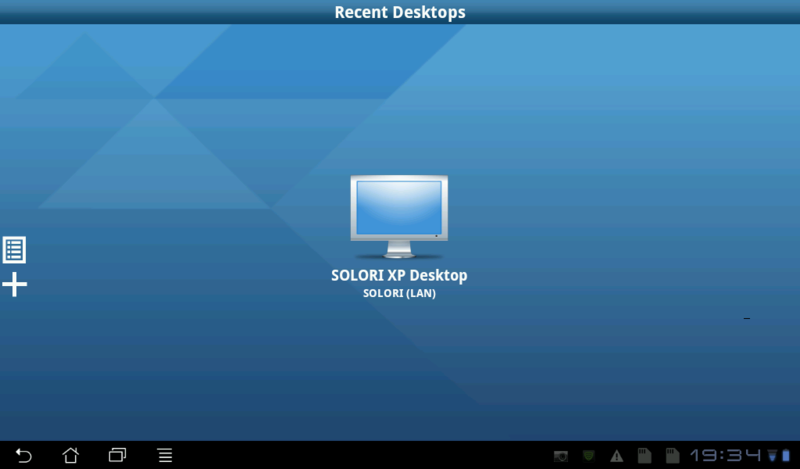 An updated VMware View Client for Android devices hit a the street today sporting a couple of enhancements for Google’s Android OS running the relatively new Ice Cream Sandwich (ICS) version; other improvements are for View 5.1 deployments only. The update is a 5.32MB download, and is available free of charge. Today VMware released a “Tech Preview” version of VMware’s View Client for Android: a PCoIP-only client suitable for LAN and WAN (via PCoIP Secure Gateway). We’ve had a quick first look this evening when the application appeared on Android Market – a free download – and it looks great. On my NotionInk Adam tablet (NVidia 1GHz dual-core) running Honeycomb 3.0.1 the display updates where just as snappy as my iPad2 running View Client for iPad. The only problem I experienced in the hour or so of working with the client is the lack of three-finger support in the Adam/Honeycomb port to spawn the pop-up keyboard. The View PCoIP Client for Android supports the same saved desktop icon paradigm as it's iPad predecessor for quick access. 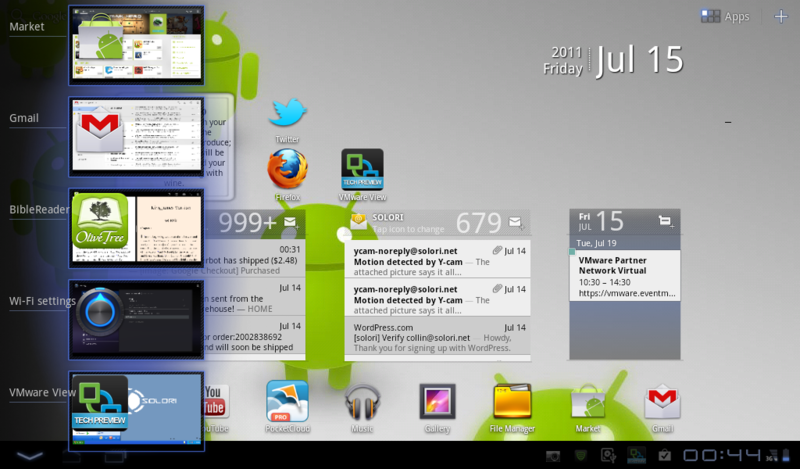 The View PCoIP Client for Android allows for desktop connections to stay active even when the app is not in the foreground - a one-up on the iPad predecessor. 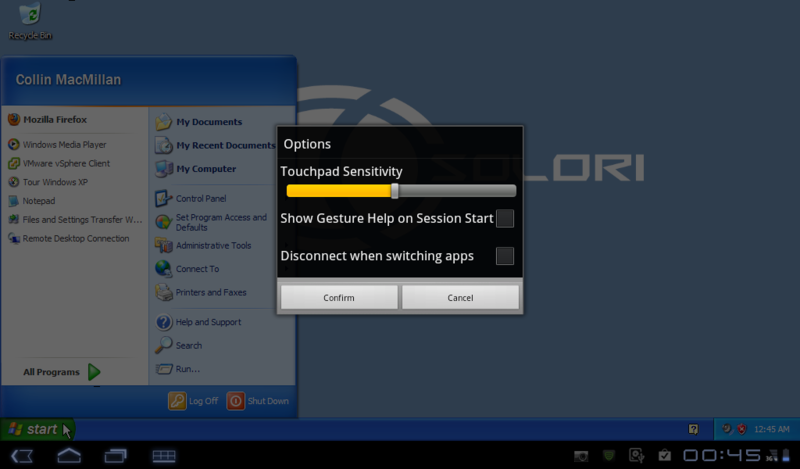 Task switching in View PCoIP Client for Android works just like any other Android application. View PCoIP Client for Android is easily restored from the background without reconnection delays. 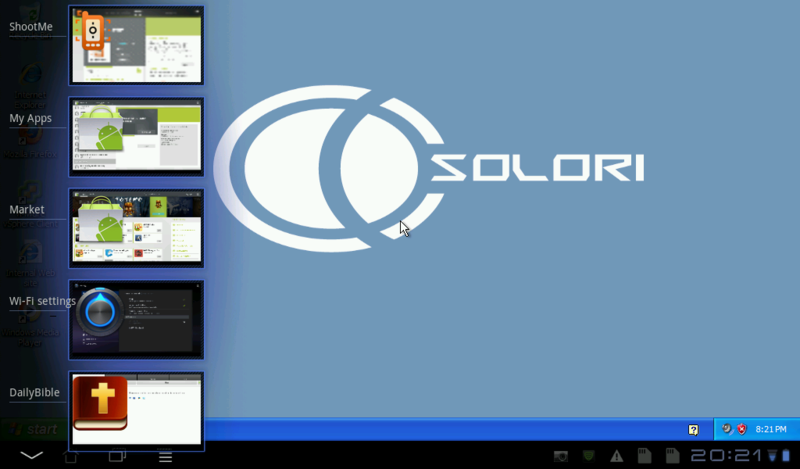 SOLORI’s Note: Although the View Client for Android was “optimized” for 1280×800 format, it still had no problem with the more limited 1024×600 Pixel Qi display on my NotionInk Adam. In fact, changes in rotation on the Android seemed faster than on iPad2 and multitasking on the Honeycomb system did no seemed to be affected to a backgrounded desktop. As another test to compatibility, I tested small-screen PCoIP goodness on my Samsung Fascinate and it rocks! Beware, there is just enough display to be useful with the pop-up keyboard on-screen, however and the scroll-back on the screen with keyboard in foreground made for interesting URL entry while trying to get to Hulu, but audio was clear and frame rates at about 3-5 fps (visual est.) but very clear. Task switching on the single-core Android Froyo device worked flawlessly too. How did Hulu fare on Honeycomb? Unfortunately it was not up to scratch in full screen, but I found it passable in the embedded mode (Mozilla 3.6). This kind of performance issue will likely be very platform dependent on Android version, CPU, display and vendor tweaks to the Google Android kernel – especially hacked kernels like the NI Adam (tested). Unlike the Apple-controlled IOS, Android leaves a lot of performance enhancements to platform providers and most just pass-on the reference kernel without significant improvement in performance. For a “preview” release, Team Fox at VMware has delivered the goods. VMware’s official blog post has a quick walk-through video. A User Guide and Release Notes are also available from VMware. It’s just a short, 270MB download separating you from managing your vCenter or licensed vSphere host from your mobile phone, Internet tablet or PC’s web browser. This simple virtual appliance performs all of the client API calls to vCenter and presents a web-based user interface that requires only basic HTML – perfect for mobile devices. It’s a bit quirky with DPM (as you’ll see later in the post) but it has a compelling feature list as well in this v1.0 fling from VMware. Launch the VI Client and log into your ESX box or vCenter instance. Select the option “Import from file” and browse to the OVF file, for example: c:\temp\vCenterMobileAccess-ovf\vCenterMobileAccess-1.0.0.10.ovf and follow the wizard next steps. In the “End User License Agreement” page, read the license agreement completely, click on the “Accept all license agreements”, and continue the steps. In the “Name and Location” page, provide the name for your virtual machine. Once the wizard completes, a virtual machine will be created. Select the virtual machine and power it on. Once it powers on, you can access the web application from your mobile device browser using the URL http:///vim. Once connected, you will see the login screen where you can provide the vCenter or ESX IP address or name as well as username and password. Installation of the virtual appliance is fairly straight forward, but there are a few “gotchas” to be encountered depending on your environment. 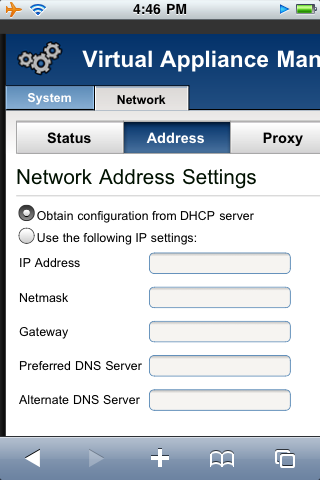 For instance, if you do not run DHCP in your management or test network, you’re going to need to drop to the console for setup. Also, the default password is extremely weak, so changing it before testing or deployment is imperative. Also, there is an incompatibility in the latest version between the appliance management console (web) and Firefox, although this issue DOES NOT extend to the vCenter Mobile Access application proper. 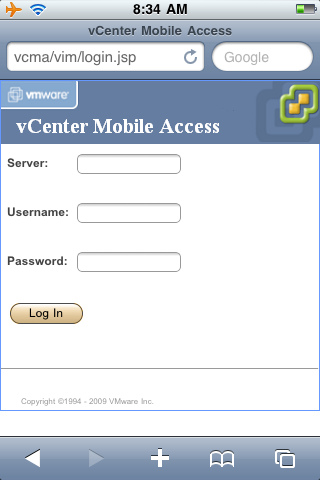 Description: The vCenter Mobile Access allows administrators to manage their datacenter environments on-the-go via mobile devices. Reviewed the deployment task summary and then clicked “Finish” to deploy. Finally, the deployment requester changed to “Completed Successfully” and I clicked ‘Close” to complete the process. Before powering-on the appliance, I disabled logging from the “Options” tab of the Virtual Machine Properties page by right-clicking on the VM, selecting “Edit settings…”, clicking the “Options” tab and selecting “General” from the “Advanced” section, then uncheck the “Enable logging” box. Next, I opened the console and powered-on the VM. Note: vCMA defaults to VMware hardware version 4. For systems with demonstrated compatibility issues with version 4 issues with vMA, or where using backup facilities that use changed block tracking, take this opportunity to upgrade to hardware version 7. Option pages from vCMA management portal.